Why should we have to choose between better quality vs. faster speed? When it comes to inkjet printing on optical discs, it seems if you want greater production in a shorter period of time, you have to accept imperfections on the printed discs, like light bending lines from the print head. Well those days are over because OptoDisc inkjet printable media gives you the best of both worlds, speedy production and excellent print quality. 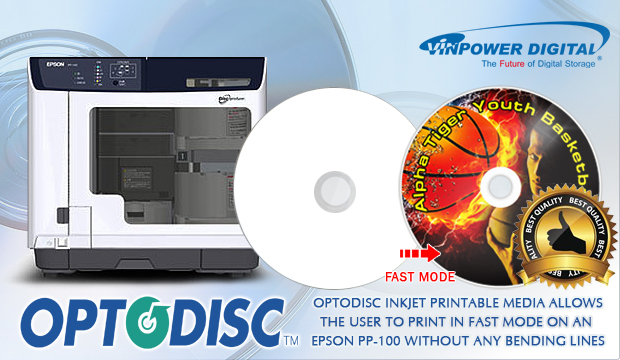 The special inkjet coating formula that is available on the entire line of OptoDisc inkjet printable CDâ€™s, DVDâ€™s, and Blu-ray discs allows users to print in the fast mode on an Epson PP-100 or PP-100AP printer to maximize production, yet wonâ€™t show any of the faint lines that typically show up with alternative inkjet printable media under the Fast Mode setting. With the special advanced absorption surface of the OptoDisc inkjet printable media, it allows the printer to apply the ink onto the discs at a faster pace without leaving the common streaks or lines that show up on other similar media. No one wants to handout less than perfectly printed discs and you shouldnâ€™t have to sacrifice production time in order to achieve it. If you really want the best quality print, in the quickest time possible at a low reasonable price point, then your best bet is to use inkjet printable media made from OptoDisc! To get more details about OptoDisc inkjet printable media as well as any of the OptoDisc media lines or Vinpower hardware, please visit our website at www.vinpowerdigital.com or contact a Vinpower representative near you. Vinpower Digital has increased the size of the internal SSD drives on all new Cronus BD/DVD/CD Plus publishing systems from 480GB up to 1TB at no added cost. In this fast paced world where everyone wants everything yesterday, thereâ€™s no time to wait on a publishing system to load and burn your Blu-ray, DVD, or CD projects synchronously. The best method to get the job done is to allow the publishing system to burn and print the discs asynchronously. However, this is not also possible on many publishing systems, especially those with more than 2 drives. 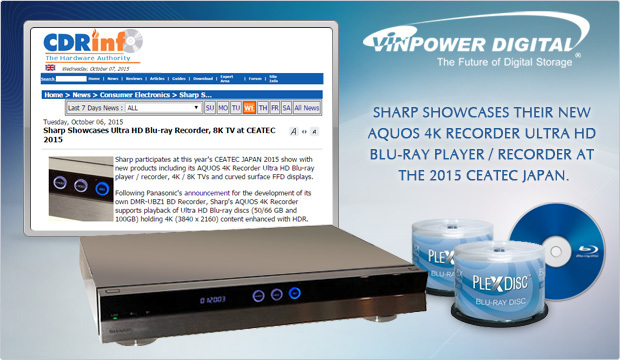 So Vinpower devised their Cronus Plus publishing systems to work flawlessly when burning even the large capacity Blu-ray discs in asynchronous mode for a faster and more efficient publishing system. Plus, with the increase from 480GB to 1TB on the internal SSD at no added cost, the Cronus Plus publishing systems can hold a much greater number of projects and work even more efficiently than ever before. 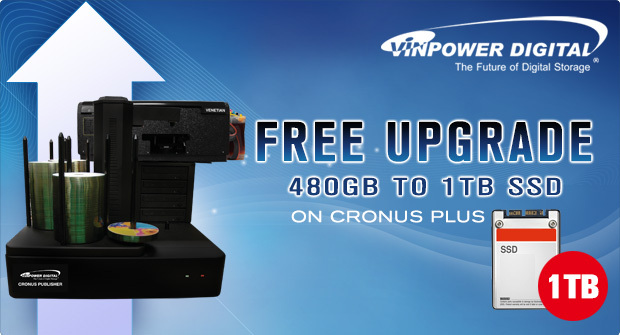 Vinpower has always been about giving more for less, so when you need a system that can quickly and efficiently burn and print optical discs through an automated system, Vinpowerâ€™s Cronus Plus publishing system, now with 1TB SSD drives, is the best solution on the market. For more details about the Cronus Plus publishing systems or any of Vinpowerâ€™s duplications hardware, components, and/or media, please visit our website or contact an official Vinpower representative. Following Panasonicâ€™s announcement of the first of its kind 4k Ultra HD Blu-ray player, Sharp introduces its own Ultra HD Blu-ray player and 4k recorder. Thatâ€™s big news because that moves us 1 step closer to having Ultra HD Blu-ray duplicators. Once people can create their own master content, then they will want to make copies and that will lead them to purchase the larger capacity BD-R media that can support the large format capacity, like BD DL or BDXL media. Plus it will lead the same people to purchase new duplicators with BDXL capable recorder drives that can handle the large capacity media. This just further exemplifies that optical discs will remain relevant and will have a sizeable impact in future technology and functionality. For more information about this new player or anything related to the duplication marker, feel free to contact a member of the Vinpower staff or an authorized Vinpower reseller. 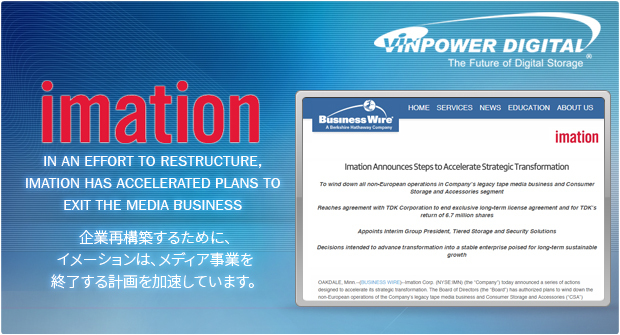 Announced this week, Imation plans to wind down its media business and end their long-term license agreement with TDK Corporation. This is a major announcement on the heels of Taiyo Yuden also announcing their decision to exit the optical disc field to concentrate on other business opportunities earlier this summer. There have been a number of smaller media manufactures and suppliers exiting the industry over the last year or two, but the fact that two of the more prominent media suppliers, in TY and Imation have made plans to move away from selling optical media, it leaves a number of customers with a void to fill for their recordable optical discs. Imation and Taiyo Yuden didnâ€™t decide to exit the market because they had zero sales, it was due to the fact that sales werenâ€™t as profitable as they had been previously and they were public companies that had to show future growth. However, there is still a sizeable market for recordable optical discs around the world. Vinpower is focused intently on being the company that can fulfill the needs of those displaced customers looking for an alternative solution to TY or Imation, but not suffer any drop off in quality or reliability. Vinpowerâ€™s OptoDisc media has quickly picked up a following of believers that the OptoDisc media will consistently and reliably perform up to and often beyond their expectations. OptoDisc media will continue to be available if virtually every format type, such as CD-R, DVD+/-R, DVD+R DL, BD-R, BD-R DL, etc., as well as surface types, including silver top, inkjet printable and thermal printable in white or silver matte, as well as the glossy water and scratch resistant Liquid Defense Plus inkjet printable. If you have not tried OptoDisc media and have been using Taiyo Yuden/JVC or Imation, this is a great opportunity to test OptoDisc today to see if it would be a perfect replacement for your business or personal use. To learn more about Vinpower Digital and our line of OptoDisc or other media and hardware solutions, visit the Vinpower Digital website, or speak with a Vinpower representative in your area.